In this way, simple illustrations incorporate a considerable amount of information that provides the opportunity to determine genotype and phenotype probabilities for monogenic Mendelian traits without the need to draw Punnett square for every parental genotype combination. Following the same procedure as the monohybrid test, students build the Punnett square using the mathematical concept in Table 4. 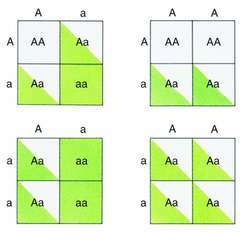 A Punnett square visually demonstrates how alleles for a given trait from two parents segregate. Question: What percent of the kittens in the Punnett square below will exhibit polydactyly, a dominant trait? But the Punnett Square illustrates the odds of any color emerging. The students were instructed to find the genotypes of the parents and child, using a Punnett square to demonstrate how their answers were determined. A chart called a Punnett square helps determine the types of traits an offspring can inherit. 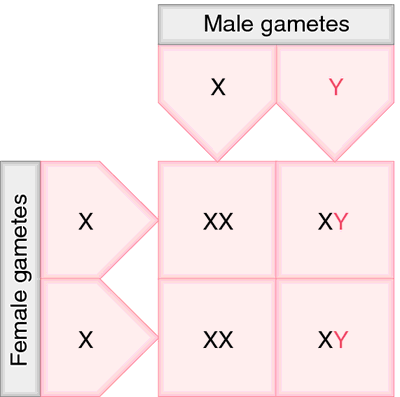 There are a few minor details that could have clarified certain ideas for laymen, such as a traditional Punnett square to help illustrate crosses more clearly, simplified definitions (a phenotype is defined here as "a manifestation of a genotype," which isn't a very clear definition for the layman), and a better explanation of dominance/recessiveness, for example. I first ask: "Based on a Punnett Square, what are the odds that a carrier of a new mutation will leave carrier descendants? We're studying Punnett squares in science class, and every time we have a lesson, I get so bored I zone out. in Springfield; participants will learn about traits and heredity and use Punnett squares and monster-parent-genotypes to design their own monster babies; free; recommended for ages 8 to 14. Here, students can practice Punnett squares and observe certain genes that are dominant or nondominant and how that affects heterogeneous or homogenous pairs.